In August this year the Daniel Andrews Government banned SRI classes from Victorian Schools. Despite the fact that this has been a valued program for many decades, and that many schools are still keen to give space for this 1/2 hour weekly lesson, the Government caved into pressure from various lobby groups. Replacing this opt-in program will be a compulsory ethics/well-being/religious curriculum. Whilst announcing that this program will run from the start 2016, the Government is yet to provide any details of its content and who will teach it. Indeed, schools remain in the dark as to what is happening. Today, The Age has reported that ACCESS Ministries are now offering a program in Victorian pre-schools, called Explore Christianity. 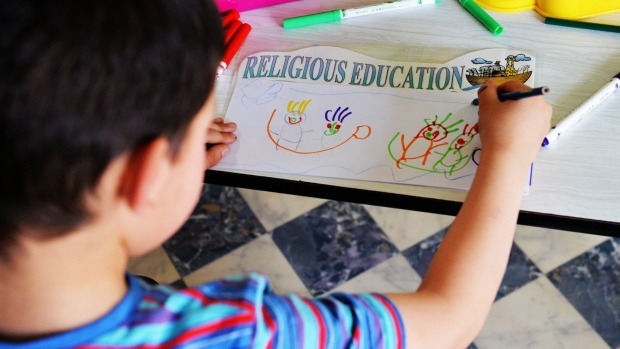 “SPECIAL RELIGIOUS INSTRUCTION – COMING TO A KINDERGARTEN AND CHILDCARE CENTRE NEAR YOU! ACCESS have now discovered a new mission field – they have transferred their proselytizing to a softer market. They are like the Gecko, who loses its tail, only to grow another one back again. They have reinvented themselves and found another way to get to the children. FIRIS has known about this for some time, and the VIC government was first notified about this from us back in May. It appears that now very young children will be segregated by religion and parents who object to their children being indoctrinated while at child care will need to accept this segregation as the norm, or find another centre. The government has been taken offguard by ACCESS’ metamorphosis and will have to either choose to deal with it – or look the other way. I agree that any program must have transparency, and provide adequate information for parents, and it should have either an opt-in or opt-out clause. These things are sensible and appear to be in place already. But even if all of these ‘concerns’ were fully met, history gives reason to suspect that FIRIS will keep pressing for this program to be shut down. Parents asked the Emmanuel Early Learning Centre to introduce this program and the Centre management agreed. The overwhelming majority of families are participating. After receiving consent forms, only 3 families chose to opt-out their children. The program teaches, “Christian values and beliefs, in addition to stories from the Bible.” In other words, it is teaching they very things that a program about Christianity should teach. Volunteers who run the program are accredited by ACCESS Ministries, in accord with strict requirements that have been set by the Education Department for SRI teachers in schools. Pre-empting any call to close down the program, Minister for Families and Children Jenny Mikakos said to the The Age that, early childhood services operated independently, and any “decision on offering religious education as part of a service provider’s program is a decision for each individual provider and parents of children attending the service”. It will be interesting to see what and if any pressure that the Government will try to apply to these early childhood centres. As it stands, they are providing a program within the law, based on parental interest and request, and with substantial by-in from both the Centre and its families. I believe that FIRIS are now proposing a protest outside the Emmanuel Early Learning in Endeavour Hills. But why? A recognised group have been invited by parents and the centre management to run a particular program.